Kenya National Bureau of Statistics hereby releases Consumer Price Indices (CPI) and inflation rates for February, 2015. These numbers have been generated using data collected during the second and third weeks of the month under review. The prices were obtained from selected retail outlets in 25 data collection zones located in 13 urban centers. The CPI increased by 0.46 per cent from 153.43 in January 2015 to 154.14 in February 2015. 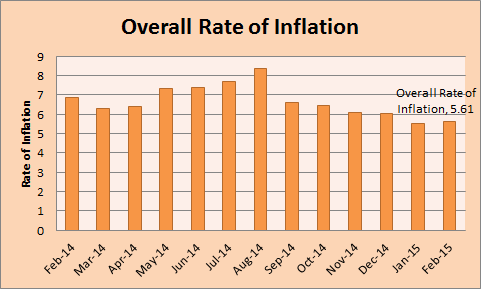 The overall inflation rate stood at 5.61 per cent in February 2015. Download CPI and Inflation Rates for February 2015.. The Leading Economic Indicators for the month of December 2014 highlights trends in Consumer Price Indices (CPI) and inflation, interest rates, exchange rates, international trade, agriculture, energy, manufacturing, building and construction, tourism and transport. Consumer Price Index (CPI) increased from 151.85 points in November 2014 to 152.51 points in December 2014. The overall rate of inflation declined from 6.09 per cent to 6.02 per cent during the same period. In December, the Kenyan Shilling appreciated against the sterling pound, the Euro, the Japanese Yen, the South African Rand and the Ugandan Shilling while depreciating against the US dollar and the other currencies. The average yield rate for the 91-day Treasury bills, which is a benchmark for the general trend of interest rates, dropped to 8.50 per cent in December 2014 from 8.64 per cent in November 2014. The inter-bank rates rose to 6.92 per cent during the period. The Nairobi Securities Exchange 20 share index dropped from 5,156 points in November 2014 to 5,113 points in December 2014, while the total number of shares traded increased from 666 million to 900 million shares during the same period. The total value of NSE shares traded expanded from KSh 14.34 billion to KSh 31.58 billion over the same period. Broad money supply (M3), a key indicator for monetary policy formulation expanded from KSh 2,260.02 billion in October 2014 to KSh 2,291.82 billion in November 2014. 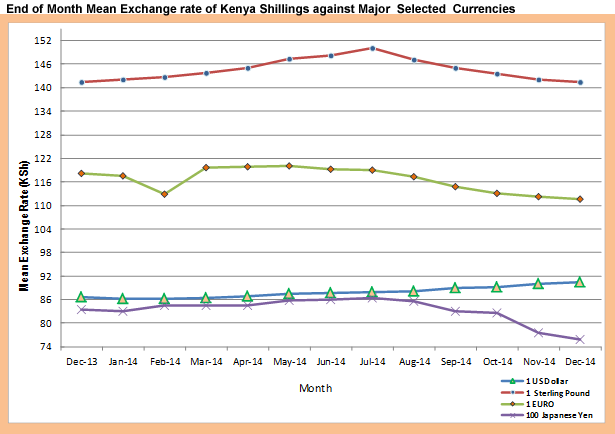 Gross Foreign Exchange Reserves went up from KSh 820.0 billion in November 2014 to KSh 893.1 billion in December 2014. Net Foreign Exchange Reserves increased from KSh 420.9 billion to Ksh 481.5 billion over the same period.